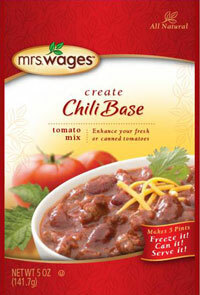 Mrs. Wages Chili Base Tomato Mix contains just the right spices with fresh or canned tomatoes, or tomato paste, for chili you’ll be proud to call your own recipe. Makes 5 pints and is ready to eat 24 hours after preparation. 5oz. Remove skins and cores from tomatoes and chop coarsely. Puree to a smooth consistency in blender or food processor. Combine mix contents with chopped tomatoes and sugar in a large pot and bring to a boil. Stir occasionally. Reduce heat and simmer 25 minutes. Stir occasionally. Chili Pepper, Salt, Food Starch, Spice, Dehydrated Onion, Paprika, Dehydrated Garlic, Citric Acid.